Even in the cool days of Spring, a pot of soul-warming soup is so welcome. 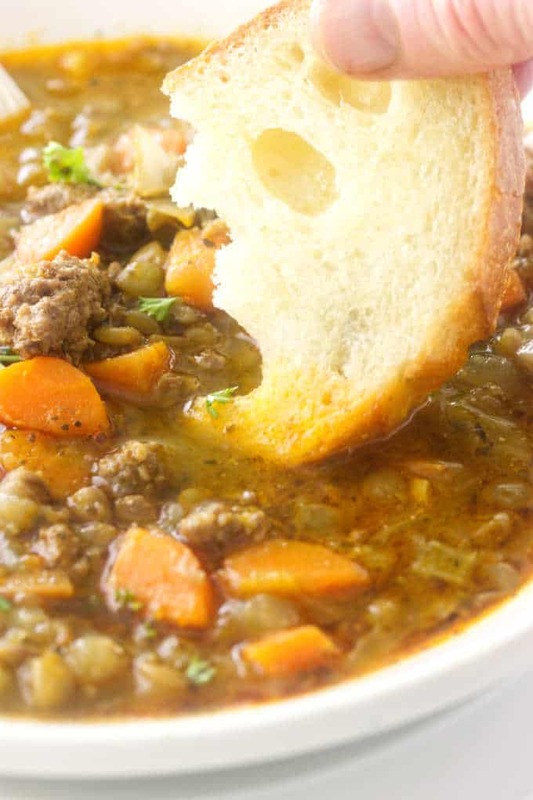 Teaming with flavors this Italian Lentil Soup with Sausage and a loaf of warm crusty bread is all you will need for an easy one-pot meal. 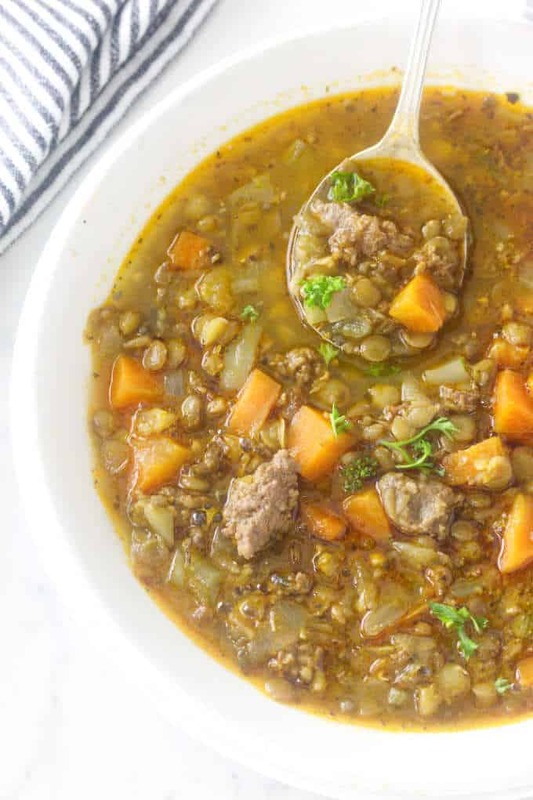 Thick and hearty with lentils, Italian sausage, vegetables, and spices in a rich broth, this soup is perfect for dinner. February is always our coldest winter month and often we do get a dusting of snow. This year we had a record-breaking snow apocalypse, and there’s more on the way! We have stocked our pantry and have a good supply of firewood for our wood stove. Let it snow! 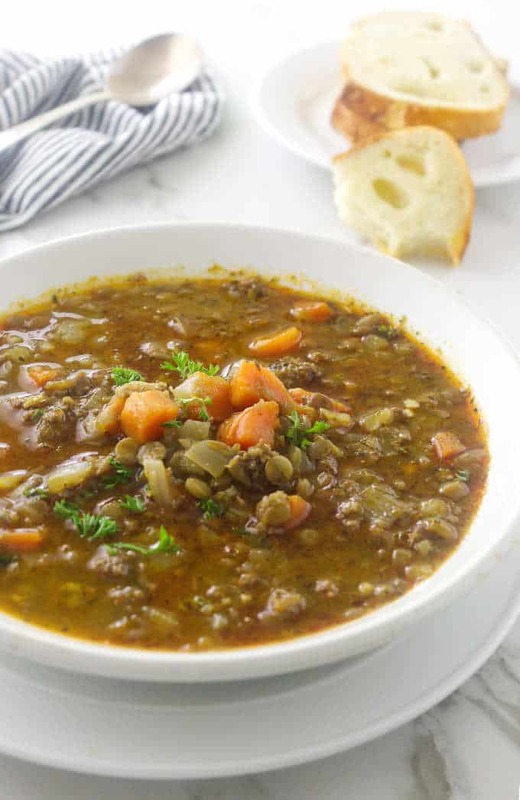 This Italian lentil soup is a hearty, cold-weather thick soup that is healthy and flavor-packed with lentils, Italian sausage and vegetables. Lentils are super nourishing and quick-cooking which make them an ideal candidate for a fast satisfying meal. Lentils very budget-friendly and can be incorporated into a variety of recipes. 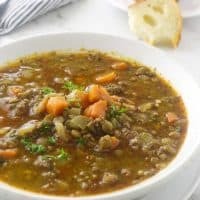 This lentil soup with sausage can also be a vegetarian soup by omitting the sausage and swapping the chicken broth for vegetable broth or water. The short answer is no, they are not beans but they are among the family of legumes that include beans. They grow in pods and shelled the same as peas. They are very nutritious and healthy. A cup of cooked lentils has 230 calories, 18 grams of protein and 15.6 grams of fiber. How many Lentil Varieties are there? Black lentils have an earthy flavor. They are also called beluga lentils due to their beluga-like appearance. Black lentils will need 25-minutes to cook. They are the most nutritious of the lentils. Red lentils have a mild sweet flavor. They actually appear orange in color and will quick-cook in 8-minutes. They are often used to thicken soups and stews. Yellow lentils have more of a sweet nutty flavor. They add a bright color to dishes and will cook in 15 to 20-minutes. Both red and yellow lentils are used in Middle Eastern cuisine. Green lentils have a peppery taste. They add interest and flavor to salads. The green lentil is denser and will need 45-minutes to cook. French lentils are greenish in color. They are also called Puy lentils as they are harvested in the French region of Le Puy, they are the most expensive of lentils. They will take 45-minutes to cook. Try them cold in a salad. Brown lentils are the most common variety in North America. They have a slightly earthy flavor and hold their shape well and favored for soups. They need 35 to 45 minutes to cook. Sort through the lentils to remove any small pebbles that may have missed the sorting machine. For every cup of lentils use 3 cups of liquid can be water or broth. The lentils will expand to at least twice the volume so you will want to use a large enough cooking pot. Do not add salt to the lentils while they cook as they will become tough. Bring the pot to a boil over high heat, then reduce the heat to simmer, cover with the pot lid and cook them for 15 to 20 minutes until tender. Add the salt when the lentils are finished cooking. 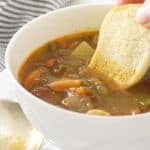 This recipe of Italian lentil soup is so easy to make. 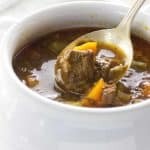 It is super flavorful and goes together quickly. We are confident that you and your family will really enjoy it. Sauté the onion, fennel, carrots, and celery until slightly soft. Add the sausage, breaking up into a small clump and cook until no longer pink. Mix the tomato paste with a little water until smooth, then add to the soup pot. Add the rinsed lentils and the seasoning. Bring the pot to a boil then reduce the heat to low and simmer for 45-minutes. Pair this hearty soup with sourdough bread. That’s it….ladle the soup into bowls and enjoy! This hearty, lentil soup with sausage takes but 15-minutes to put together and cooks in less than one hour! It is snowing outside and this is going to be a yummy dinner tonight! 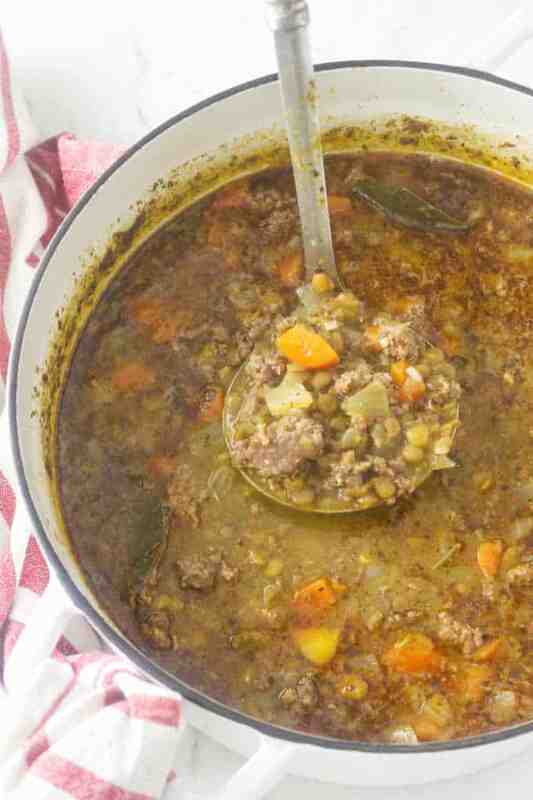 Italian Lentil Soup with Sausage is thick and hearty with lentils, Italian sausage, vegetables and spices in a rich broth. Sort through the brown lentils to remove any small pebbles. Rinse in cold water, drain and reserve. Heat oil in a Dutch oven over medium heat. Add onion, fennel, carrots, and celery; cook, stirring often for 5 minutes. Add sausage, breaking up with a fork. Cook, stirring often, until no longer pink, about 5 minutes. 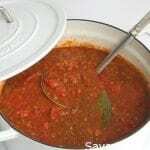 In a small dish add the tomato paste and water, whisk together until smooth then add to the soup pot. Pour in the chicken broth, add the reserved lentils, Italian seasoning, cumin and bay leaves. Bring soup to a boil. Cover and reduce heat to low. Simmer until lentils are tender, about 20-30 minutes. Add salt and pepper to taste. An easy way to sort the lentils is to spread them out on a sheet pan. Discard anything that is not a lentil. When breaking up the sausage leave small chunks of for flavor and interest. This is a hearty, thick soup. Add additional chicken broth for a thinner soup. Even through the days are warming up, we’re still eating soup! Love it, and particularly like soups made with dried legumes and pulses. Lentil soup may be best of all — this looks excellent. Thanks! Thank you, John….it tastes excellent too!